In this timely thriller, single father Dennis Nash (Andrew Garfield) is evicted from his home and his only chance to win it back is to go to work for Rick Carver (Michael Shannon), the charismatic and ruthless businessman who evicted him in the first place. It's a deal-with-the-devil that provides security for his family; but as Nash falls deeper into Carver's web, he finds his situation grows more brutal and dangerous than he ever imagined. While many films have covered the various ins and outs behind the 2008 housing bubble in exhausting detail, the crash's complicated economic minutia often have a tendency to overwhelm the crisis' disturbing human struggles. Rather than retread the hows and whys, director Ramin Bahrani's '99 Homes' attempts to shift its focus away from dipping stock data and toward the real life tragedies left in their wake -- resulting in a gripping thriller that examines the cost of "success" within a corrupt system. 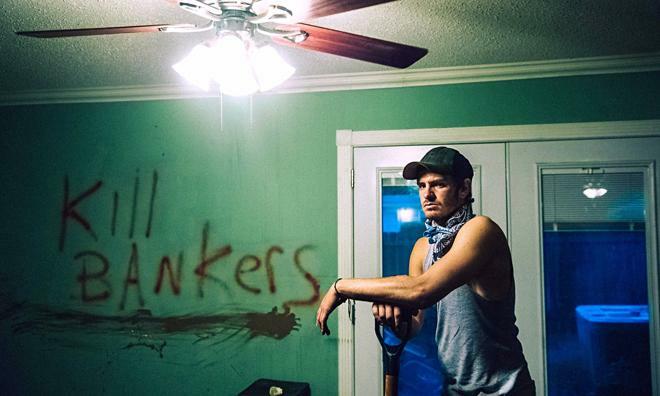 After being evicted from his home along with his son and mother, unemployed single father Dennis Nash (Andrew Garfield) is left without many options. Desperate for a job, Nash turns to the very man who kicked him out of his house, a real estate broker named Rick Carver (Michael Shannon). Hoping to earn enough to buy his house back, Nash ends up working for Carver, and soon finds himself deeply entangled within the increasingly corrupt housing market. As roles are reversed, Nash will have to decide just how far he's willing to go to succeed. In the film's opening scene, we are first introduced to the morally ambiguous Rick Carver through a powerful extended single shot, offering a rather enlightening first impression that uses form to enhance our interpretation of the character. After one of Carver's evictees commits suicide, the camera pans from the brutal aftermath to Carver's intense gaze, directly connecting the two images on screen, irrevocably tying the business man to the violent repercussions of his work. From there, the shot follows Carver as he answers a phone call, brushes off the police, and heads straight out the door to his car -- all in one unbroken sequence. On the surface, it seems as if the man is too busy to even care about the death, but key intonations and expressions from Michael Shannon clue us in to the his deeper distress. He's trying to dismiss the trauma, but the weight of the opening image carries through, heightened by the lack of cuts, allowing us to witness the build-up uninterrupted. This dichotomy between the outward callousness of his job and more internal pangs of unease goes on to layer much of Shannon's performance, and the actor does a remarkable job of creating a multifaceted antagonist who is capable of being truly despicable without becoming a one-dimensional villain. Likewise, co-star Andrew Garfield imbues Nash with a palpable level of desperation and frustration, easily allowing the audience to empathize with his plight. And much like in the opening shot with Carver, director Ramin Bahrani uses camera work and editing to enhance the character's emotional beats. On that note, Nash's harrowing eviction sequence is a real standout, as the filmmakers employ chaotic handheld shots and disorienting cuts to heighten both the outward and internal confusion, disorder, and loss of control present in the scene, placing the audience in the same frenzied state of mind as the protagonist. As Nash gradually transforms throughout the runtime, the narrative maintains its focus on the human struggles related to the financial crisis, offering an affecting peek into the lives torn asunder by rampant foreclosures. And though the film touches upon corruption and blame within the housing market, banking world, government bureaucracy, and citizens themselves, the story ultimately avoids any real political lean or intentions. The details of the crisis are deeply imbedded into the script's DNA, but at the end of the day the movie really becomes an absorbing morality tale -- one tied to themes of greed, exploitation, family, and the true nature of success. With that said, the film's approach can be lacking when it comes to subtlety. Though the ironic role reversal that Nash ultimately finds himself in does prove to be rather powerful, the execution can be just a tad overbearing at times. Likewise, the resulting drama is fairly predictable. Thankfully, these minor flaws prove to be just that, minor, and the climax takes us to an appropriately open-ended yet emotionally satisfying conclusion. 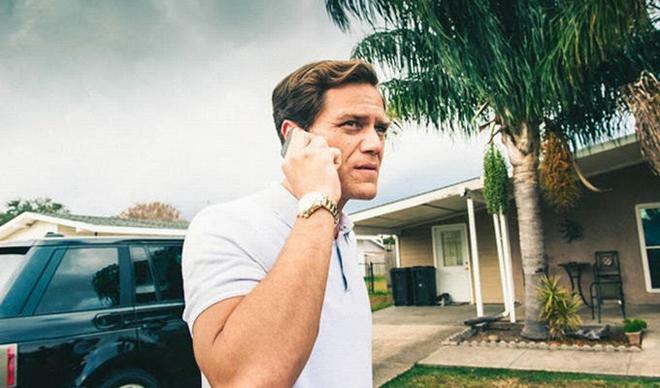 Using the 2008 housing bubble as its backdrop, '99 Homes' effectively portrays the human struggles related to the crisis while simultaneously offering a universal parable related to timeless themes of corruption, guilt, ethics, and empathy. Marked by strong direction and a captivating performance from Michael Shannon, the film leaves a lasting impact -- one that proves to be moving and deeply frustrating in equal measure. 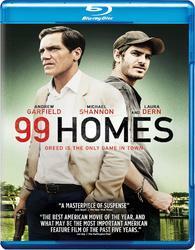 Broadgreen Pictures brings '99 Homes' to Blu-ray on a single BD-50 disc that comes housed inside a standard keepcase. After some skippable trailers, the disc transitions to a traditional menu screen. The packaging indicates that the release is region A coded. The movie is provided with a 1080p/AVC MPEG-4 transfer in the 2.40:1 aspect ratio. Free from any major technical quirks, the picture appears to respect the director's intentions. The source is clean, with no notable signs of compression or artifacts (outside of some very fleeting aliasing). Detail is solid throughout, revealing all of the anguish on the characters' often troubled faces -- but the image often retains a comparatively digital look and depth can be on the flat side. Contrast is intentionally exaggerated with bright whites that come close to blooming, giving many shots a faintly glowing quality. Thankfully, blacks remain deep without crushing. Colors are well rendered but the palette mostly avoids traditional pop and goes for a more low-key appearance with a slightly yellow tone. Though the video might not always be impressive in a traditional sense, the transfer preserves the filmmakers' chosen aesthetic well offering a very fitting visual style. The film is presented with an English DTS-HD MA 5.1 track and a Spanish DTS 5.1 track, along with English SDH and Spanish subtitles. With strong design work, the mix helps to enhance the film's realistic atmosphere and building tension. Speech is clean and well prioritized with no balance issues. The soundfield features solid ambience with layers of subtle texture that help to expand upon specific locations with appropriate effects like traffic and nature sounds. Likewise, louder and more aggressive scenes set in construction sites and rowdy motels offer strong surround use, naturally spreading characters and clatter around the room. Specific directional effects, like voices and a flying helicopter, also come through with smooth imaging between speakers. Finally, the film's escalating score features strong separation and fidelity, helping to create an uneasy feeling in key dramatic scenes. '99 Homes' comes to Blu-ray with a delicate but layered audio mix, immersing audiences in the movie's human drama without getting lost in unnecessary gimmicks. Commentary – Writer/Director Ramin Bahrani provides a steady and informative commentary. Bahrani elaborates on locations, research for the script, lighting, production design, editing, characters, and casting. He also discusses how certain shots were approached and spends a good amount of time thanking all of his collaborators. After the commentary concludes, a deleted scene dealing with strategic default follows the film with or without commentary. It's a decent inclusion but it would have been more convenient if the scene was selectable from the main menu. 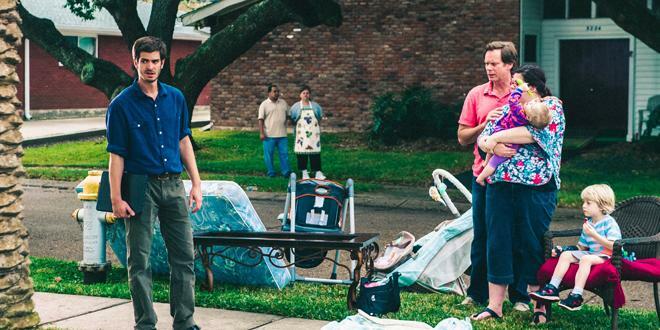 '99 Homes' is an absorbing thriller that places a human face on the 2008 housing market crash. On the technical front, the disc features strong video and audio, respecting the director's aesthetic intentions. Though supplements are slim, the included commentary is well worth a listen. More than just a retread of the economic crisis, the film becomes a genuinely affecting morality tale and the disc itself is very solid. Recommended.